I am obsessed with lip balm, I always have to have at least one on me at all times so this post it dedicated to some of the man lip balms I own and use on a regular basis. I’m going out hard to begin with, probably the most frivolous purchase I have ever made it’s the By Terry Baume de Rose – This lip balm is probably the best one I have ever purchased and I tell you what it would want to be for the price tag. It is so creamy and luxurious on the lips and has a heavenly scent of rose, if my lips are in a dire situation this is the lip balm I head for. Next up is a new one but something that I can see myself getting a lot of use from it’s the Clinique Superbalm Moisturising Gloss in Apricot – I purchased this the other day thinking it would be incredibly useful to have in my handbag, something that is moisturising yet has a hint of colour. It has a lovely subtle peachy pink shade and adds a beautiful gloss to the lips. I also think this will be great for travelling, my lips always get super dry on planes so I’ll definitely have this in my carryon. 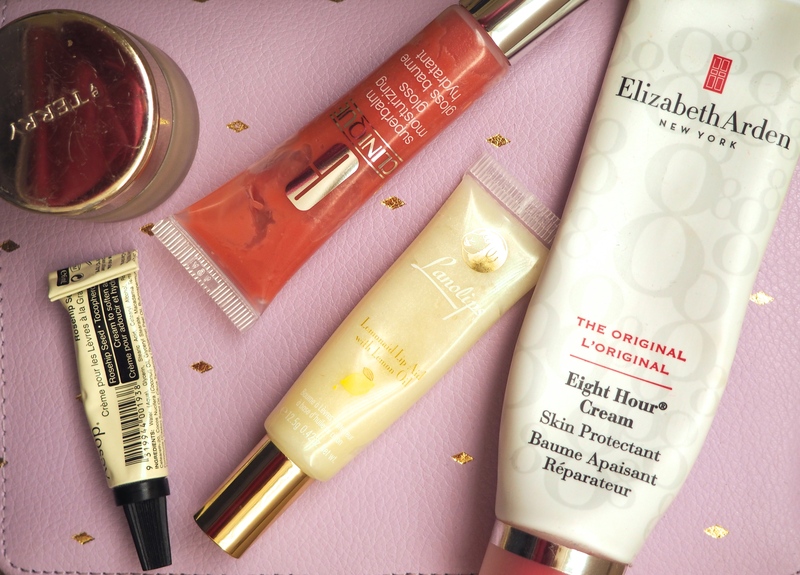 Another brilliant all rounder lip balm is the cult classic Elizabeth Arden Eight Hour Cream – This is an absolute classic for a reason, it does everything! I use this on my lips every night before I go to bed and know that it will protect them, it also works on my hands and cuticles when they are a bit dry and when my dry flaky patches on my cheeks to add some real moisture and protection. Now that is a real all rounder isn’t it? I have also had this one tube for a very long time so you’re really getting your moneys worth with this one! This next one is a real favourite of mine it’s the Lanolips Lemonaid Lip Aid – I have had a few Lanolips products in the past including their 101 ointment and enjoyed them so much so I knew I would love the Lemonaid lip aid as well. This is perfect as it is extremely moisturising as well as having little flecks in it which very gently exfoliates the lips which really comes in handy when they are particularly dry. The smell of this is stunning, it’s so fresh and lemony, just another reason to love it. Finally I have quite an unusual lip balm it’s the Aesop Rosehip Seed Lip Cream – As the name suggests it is a lip cream so the texture is quite thin unlike most balms that are very thick but this cream really sinks into the lips and leave a protective barrier. What I like to do most with this one is layer it under a thicker balm, that way you get double the moisture. Again the scent is beautiful, much like all the Aesop products it has a great earthiness to it. Seeing as I can’t live without lip balm I would love to hear what lip balms you love? Thanks lovely! Eight hour cream is just a miracle!